Luisa Capetillo made headlines as the first woman in Puerto Rico to wear pants in public. As a champion of female workers’ rights, she didn’t stop there with her defiance of gender norms. 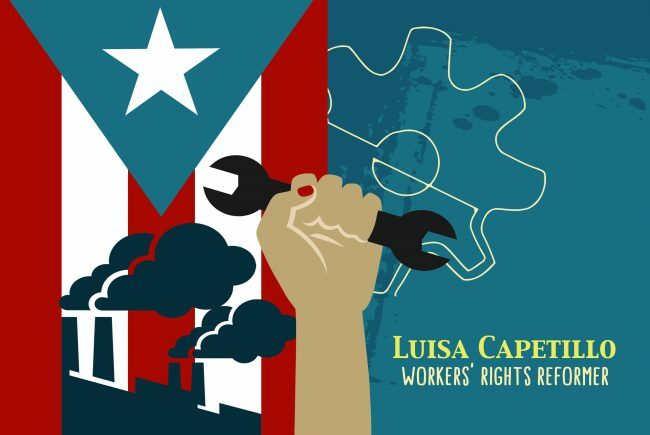 Uninhibited by the traditional gender roles of the early 20th century, Capetillo’s radical ways of thinking positioned her as a leader in the feminist labor movement, a prominent member of the labor union, and one of Puerto Rico’s first suffragists. Her involvement in labor unions began when she read newspaper articles to the employees in a tobacco factory while they worked. While she was employed there, she learned that the Free Federation of Workers organized tobacco factory workers in the area to demand better wages. Believing that education was the key to freedom and that fair pay would lead to more opportunities for women, Capetillo dedicated herself to advocating for the rights of the working class at the start of Puerto Rico’s industrialization, writing literature in support of strikes and to educate the masses. By 1910, she was working as a reporter for the Free Federation of Workers newspaper before founding her own — La Mujer, which focused on women’s rights issues — in addition to writing a book condemning the poor treatment of women in the work force and advocating for the importance of equal education opportunities. Over the next few years, Capetillo wrote articles, gave lectures and organized protests during her visits to New York, Florida and Cuba. She returned to Puerto Rico to organize and participate in the Sugar Cane Strike of 1916 with more than 40,000 workers, which resulted in a national salary increase for the laborers. Whether she was being arrested for wearing pants or inciting riots, Capetillo showed courage and passion as an activist to challenge mainstream ways of thinking and left a lasting impact on Puerto Rico. Throughout her career petitioning for workers’ rights and writing books, plays, essays, articles and correspondence with other activists, Capetillo shined a light on the oppression and discrimination women faced and encouraged them to fight for social equality and justice.